The Michigan Wolverines take on the Rutgers Scarlet Knights on Saturday, October 8, 2016 at High Point Solutions Stadium. The opening line for this game has Michigan as 26.5 point favorites. This season the Wolverines are 3-2-0 against the spread and their over/under record is 4-1-0. The Scarlet Knights have an over/under record of 3-2-0 and they are 2-3-0 against the spread. Wilton Speight finished with 219 yards through the air for Michigan last week. He completed 20 passes out of 32 attempts for a 63% completion percentage. The Wolverines were led in rushing by De'Veon Smith, who finished with 66 yards on 17 rushes. He ended the contest with an average of 4 yards per carry. Amara Darboh was the team leader in receiving with a total of 87 yards and 6 receptions. He finished the game with an average of 15 yards per reception. As a team in that game Michigan got a total of 21 first downs. Of those first downs, 11 came on the ground while 8 came through the air. They ran 76 total plays for 349 yards for the game. The Wolverines ran for 130 yards on 44 attempts. 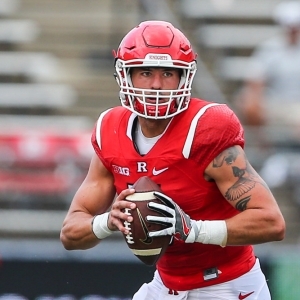 Chris Laviano finished with 33 yards passing for Rutgers last week. He went 3 for 12, resulting in a 25% completion percentage. The Scarlet Knights were led on the ground by Robert Martin, who finished with 40 yards on 13 carries. He ended the game with an average of 3 yards per rush. Jawuan Harris led the team in receiving with 33 yards and 3 catches. He finished the game with an average of 11 yards per reception. Rutgers had 9 first downs total. 6 came from running the ball and 2 came from a pass. They ran 54 total plays for 116 yards for the contest. The Scarlet Knights ran for 83 yards on 38 carries as a team. Michigan scores 44.4 points per game on offense this season, which ranks 10th in Division 1. In the passing department, they average 20.2 passes on 31.6 attempts for a 63.9 percent completion percentage this season. They throw for a total of 234.2 yards per game through the air as well, which ranks them 69th in college football. The Wolverines run for an average of 209.8 yards per game on 42.8 attempts for an average of 4.9 yards per carry. That ranks them 37th in the nation. They also run 74.4 plays per contest and average 6 yards per play for an average of 444 yards per game, ranking their offense 51st overall this season. The Wolverines average 23.2 first downs per game which ranks them 46th in the country. They accumulate 43.8 penalty yards per game via 4.6 penalties, which ranks 110th in the nation. Michigan allows 135.4 passing yards per game, ranking 2nd in D-1, and they allow 12.4 points per contest on defense, which ranks 6th. They give up 12.2 completions on 26.2 attempts per game for a completion percentage of 46.6. The Wolverines allow 112.2 rushing yards per game on 34.4 carries for an average of 3.3 yards per carry, which ranks their rush defense 24th in the country. Michigan allows 247.6 total yards per game including 4.1 yards per play, which ranks their overall defense 5th in terms of yards per game. They force 1.8 turnovers per contest and get flagged for 5.8 penalties for 45 yards per game, ranking them 23rd among D-1 teams. Rutgers averages 21.8 points per game this season on offense, which ranks them 109th in the country. In the passing department, they complete 12.6 passes per game on 26.6 attempts for a 47.4 percent completion percentage. They throw for 140.2 yards through the air per game, ranking them 123rd in Division 1. The Scarlet Knights run for an average of 193.6 yards per game on 44.6 attempts for an average of 4.3 yards per carry this season, which ranks them 51st on the ground. They also run 71.2 plays per game and average 4.7 yards per play for a total of 333.8 yards per game, ranking them 116th in the country on offense. The Scarlet Knights get an average of 18.2 first downs per game, which ranks 105th in the nation. They average 40.8 penalty yards per game via 4.6 penalties, ranking them 116th in college football. Rutgers allows an average of 196.4 passing yards per game, which ranks 32nd in Division 1. Their defense overall allows 32.4 points per contest, which has them ranked 97th in the nation. They give up 16 completions on 27.4 attempts for a completion percentage of 58.4 per game. The Scarlet Knights allow 227.4 rushing yards per contest on 43.2 carries for a 5.3 average per rush, ranking their overall rush defense 112th in the country. Rutgers allows 423.8 total yards per game for an average of 6 yards per play, which ranks 84th in D-1. They force 2 turnovers per contest and 6.8 penalties for 55.6 yards in each contest, ranking 69th in the nation.